I'm just back from my Nerdy Education Book Club. This is the one where we pick education-related texts and discuss them in terms of our own jobs, experiences, and philosophies. Tonight, we discussed a book on how you should only teach reading, writing, and discussion; and until you are teaching those things well, you shouldn't do anything else. The book was called Focus by a guy named Mike Schmoker. There were parts of the book I really enjoyed and learned from. For instance, Mike really drove home the importance of checking for understanding. This is something I haven't done so well in the last few years, so I appreciated the pep talk. Other parts of the book, I didn't care for. Basically, those were the parts about how any idiot without an ounce of creativity can teach a good lesson if they just follow an easy formula and why won't the administrators just adequately supervise and enforce. Overall, I found the book to be condescending, but still useful. Does that make sense? Anyway, if you want to read it, as Lee says, you should. Shef has homework now. 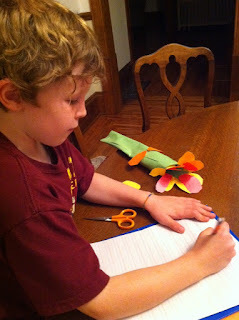 Here, he's working on a word wall project in which he had to write a story about a flower AND design the flower. He came up with a great story idea involving a stream, a giant mango, and a wand. I was really happy to sit around and talk about the story with him, but the fact that he's become obsessed with perfect handwriting really slowed us down. "Keep writing!" I told him. "We can fix it on the final draft!" Today, while Mac was in the bathroom ("Give me privacy," he tells us after we help him disrobe), Shef asked him something about his "wiener." "Shef!" I hissed. "Don't teach him that word!" "Oh," he said. "He already knows that word, Mom." I rolled my eyes. "Because of YOU," I said. "Yes," he nodded, going back to his art (?!) project. "I AM an excellent teacher. Shef has been yacking my ear off on the ways to and from school. I actually love it a lot. He tells me all kinds of good stuff. Recently, he told me about how most of the second graders had decided whom to marry. Henry might marry Kelly or Maia, for instance. "Who are YOU going to marry?" I asked. "I can't tell you that, Mom," he said. "I also know who Clare is going to marry." "I'm sworn to secrecy, Mom." Another topic of conversation was who gets in trouble all the time. "So-and-so has been to the office FIVE times!" Maniacal laughter. "That's not so good," I said. "I bet he's working on it." "Well, I've been working really hard," Shef reported. "I haven't had any breaks. I haven't even been asked to go to my seat. I HAVE HAD some warnings. But no breaks. But LAST YEAR! I had SO MANY BREAKS!!!!" Maniacal laughter. Yeah, kid. I had those conferences with Mrs. J. so I know all about the damn breaks. So far, second grade is a real trip. Tonight, I went to Shef's back-to-school night. I thought MY back-to-school night was stressful, but the poor elementary teachers have to give 75-minute presentations! Shef's teacher, Mr. B., was pretty fantastic. Totally charming, and he made second grade seem like the BEST YEAR EVER. Afterward I told Mr. B I thought he was great. He seemed appreciative. I generally appreciate it when people compliment my back-to-school night presentations. The other day, one dad told me he thought mine was "very hip." Love that guy. Just now, Shef told me that he wasn't planning on dating until college. Good, Shef! Let's go with that! Obviously, I have loved my students a ton. Last year I taught mostly juniors, which means they are now applying for college. I told many of them I would do their letters of recommendation. I committed to this before I accepted my new position. Rachel told me I should just tell them I'm so sorry, but I can't do these letters. You know, since I no longer work at that school, and I'm completely overwhelmed with the responsibilities of my new job. Jordan told me that I should absolutely not write the letters because anyone else could do that, and in fact in her experience as a college admissions officer, the letters don't really make that much of a difference anyway. Dobby told me that I should do the letters because it's the right thing to do. So, thanks Dobby! If I didn't do them, I'd feel terribly guilty probably for the rest of my life. So, I'm doing them. I really don't have time to do them, but I'm doing them anyway. I've done eight, and I have like fifteen to go. Everyone keeps talking about CURRICULUM NIGHT like it's a really huge ordeal. I am thinking I can handle it, but I hope I'm not wrong. 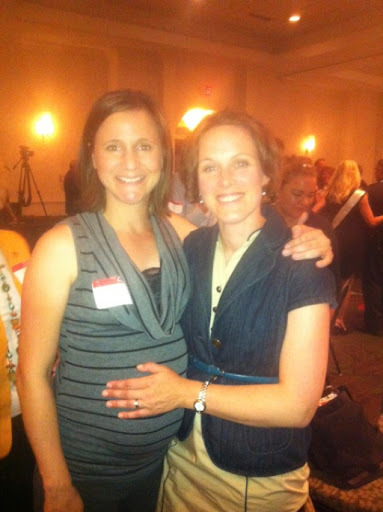 Also, Renee's having another baby, and I'm really happy about it. This has been an intense weekend of 9/11 memorial events. I have a family member who was incredibly brave. On September 11th, 2001 he stormed the cockpit on Flight 93 that then crashed in Shanksville, Pennsylvania. Remembering the shock and grief of 9/11 is difficult, but I love to hear stories about people who've decided to make a positive difference in part because they were inspired by the passengers on Flight 93, including my uncle. I got a chance to speak about kids and community service at a Minnesota's National Day of Service event yesterday in Minneapolis. Afterward, a reporter gave me a really nice compliment about my speech. "You must do this kind of thing a lot," she said. "Oh no," I told her. "The rest of my family is in Shanksville, so they brought out the B team for this." The A-team got to meet President Obama, but I got to talk with Senator Klobuchar and Governor Dayton. Those guys are cool too. Thanks 9/11 heroes! You've left gigantic shoes to fill, but you've inspired thousands of people to give it a go. 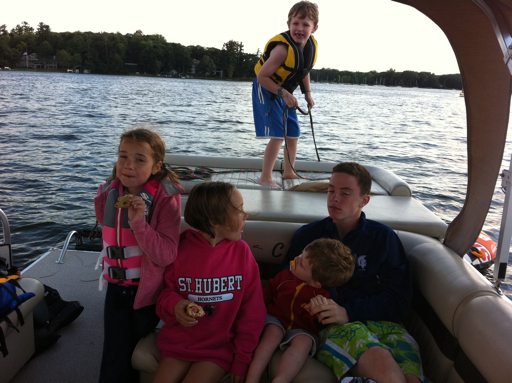 Just a few cousins cruising Lake Minnetonka eating some chocolate chip cookies. You know, just a normal Minnesota evening. Wish u were here! I've have a great first week of school with the yoots. We rolled into the weekend after discussing our trip to Camp next week. It turns out that all of the eighth graders go to a camp to bond. We do high ropes and rock climbing and canoeing and stuff. And because we're short on parent volunteers, the teachers will have to sleep in the cabins with the yoots. This is one of those times when I'm incredibly grateful to have had five years of camp counseling experience. I'll be honest: the biggest hurdle for me in the current blogging challenge is the requirement of an image. I've really had to phone a few images in because of this. Of course, Pronto would say that phoning it in is actually great blogging. Perhaps I just need a change of perspective. Anyway, I decided I don't care that the deadline has come and gone and that technically I failed the challenge. I'm going to complete these last few letters! I'll finish if it's the last thing I ever do!